When I first moved to Vancouver, almost 10 years ago, Tsawwassen GC was one of the first courses I played on a regular basis. The club used to host a weekly money game called the Snowman. The entry was $20 with portions going to low gross, skins and a deuce pot. The par-64 executive layout was a tricky mix of par 3s and short par 4s with the odd par 5 mixed in. It was all weather, frustrating, yet loads of fun and great practice. Knowing it had to improve course conditions to survive in a competitive lower mainland golf market, the ownership team decided to fully renovate the course. The brand new course and associated real estate development opened in 2012. Designed by Tsawwassen-based golf course architect Ted Locke, Tsawwassen Springs is a hybrid course of sorts, featuring a mix of four par 5s, six par 3s and eight par 4s. With a par of 70 and measuring 5,439 yards from the back tees, the course is quite short by today’s standards, yet some narrow fairways, many undulations and well-placed hazards really keep you on your toes. When asked about the course, general manager Chris Hood offers, “You will hit every club in your bag. The drainage is excellent, and the course playable 12 months of the year. With short walks between greens and tees, the average round is about 3:45.” I couldn't agree more; we played a recent tournament round in well under four hours and the conditions were excellent. One of the signature holes is the par-5 fifth. At just 475 yards from the back tees, it is not long, but what it lacks in length it makes up for in intrigue. Driving from a slightly raised tee adjacent to the fourth green, you are asked to hit a narrow fairway flanked by a hazard all along the left side and a sparse stand of trees on the right. A second small hazard exists on the right side just where a long drive can reach. While the tee shot is fair, it can be intimidating if you prefer to curve the ball. A well-struck drive will leave approximately 200 yards to a sloping green positioned partway up a hill to the left. A ball curving from right to left has every chance of hitting the receptive green, which has been designed to corral the correct shot. 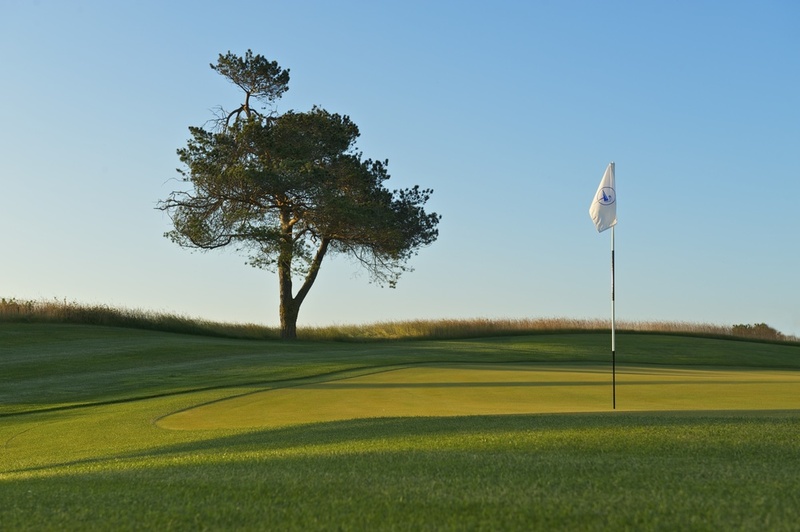 This hole, like many others, offers a great chance for eagle or birdie, yet has the teeth to keep you honest. Another great hole is the dogleg right par-4 14th. At 334 yards, really long hitters may be tempted to hit across a large pond, although most players will choose the generous fairway to the left. With numerous rolls and wrinkles to aim at and clear sight lines, the tee shot is as difficult as you want to make it. The green is long, narrow and features a large, undulating tier in the back third. With a well-placed bunker at the midpoint on the left and a narrow green centre, the approach must be precise to say the least. In hindsight, choosing the safer play off the tee will leave a much trickier approach. If I had to offer a criticism it would be towards the scaled down nature of the course. The reduced size of green surrounds, putting surfaces, collections areas and bunkering, really test the accuracy of your approach shots and short game skills. In my mind, at times a little too much for the beginner golfer, although it is a wonderful test of accuracy and short game. Tsawwassen Springs is a challenging, yet eminently fun layout, providing something for everyone. It is a championship golf course, scaled down to a length that can be enjoyed by all.